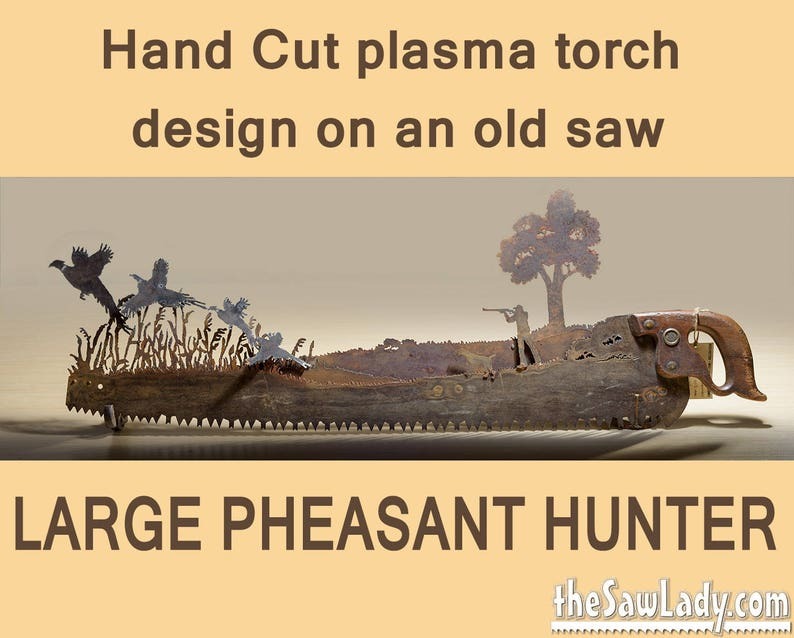 This saw shows a pheasant hunter taking aim as the birds lift off. Behind him, a deer watches the scene unfold. I can also do slight customization on this saw if you have a special story you want to tell. These large 2 man saws make great display pieces that can tell a story of your family farm, your business or any aspect of your life. Most "large" handsaws are approximately 36" to 48" long. Each metal art piece I make is cut by hand. This allows me to make each one a little different. It allows you to request a custom design or addition that lets you tell YOUR story. I also think that my metal art has much more character than those cut by machines. I believe that a hand made gift is always preferred to something machine made (but maybe that's just me). If you have any question about what I can do for you, please contact me before ordering. I’m really enjoying the process of delving deeper into metal art and exploring new techniques. A recent trip to local sales resulted in the purchase of a quantity of hand saws. This is a new ‘medium’ for me and I’m having a lot of fun designing these and then cutting them out in my shop. Pheasant Hunter 2-Man Saw - (plasma) cut TWO-MAN saw Metal Art | Wall Decor | Recycled Art - Made to Order - Great gift for hunters! CUSTOM DESIGN - Hand cut plasma torch design on a meat saw with a stained glass background - a unique gift for someone special! Horses or? Duck Hunter 2-Man Saw - (plasma) cut TWO-MAN saw Metal Art | Wall Decor | Recycled Art - Made to Order - Great gift for hunters! CUSTOM DESIGN - Hand cut plasma torch design on a bow saw with a stained glass background - a unique gift for someone special! Horses or? Turkey Hunter 2-Man Saw - (plasma) cut TWO-MAN saw Metal Art | Wall Decor | Recycled Art - Made to Order - Great gift for hunters!